Various Artists - Space Is The Plaice. Vinyl LP. Bleep. Pussyfoot is back with one stonking big compilation album. ‘Space Is The Plaice’ is a 28-track aquatic space opera which fits neatly onto triple vinyl and a double CD with the extended digital version spanning a massive 35 tracks. The album sees artists contributing worldwide: UK, Japan, Hong Kong, Thailand, USA, and all over Europe. The album artwork by Dan MacMillan and Kieron Livingstone melds together psychedelic prog-rock with space electro-eccentrics themes which cover the 3LP with its tongue in cheek Douglas Adams inspired designs. Howie B Featuring Norman Reedus – A Letter From Space This may seem like the unlikely pairing of an electronic music man and a zombie killing superstar (Walking Dead) but these boys have a friendship that spans over 20 years. Reedus lends his vocals to an astronaut's love letter written while looking down on the world from space. A dramatic and beautiful spoken word piece with an eerie treated piano and electronic synths. Blood Wine Or Honey – Brilliant Pebbles BWOH are: Shane Aspegren, Joseph von Hess and James Banbury – all multi instrumentalists. Their style builds on tribal rhythms, electro-psychedelia, and afrobeat sounds to create an eclectic sound. Blood Wine or Honey are a favourite of BBC 6 music DJ Gilles Peterson and this track continues where their album left off. Ancient Lights Featuring Flowdan – Crash Landing Go-to producer Joe Hirst’s musical alias Ancient Lights is joined by Flowdan, AKA the founding member of Roll Deep and massive Grime MC. Flowdan lends his vocal stylings to this ambient electro grime track. Slow building synths ebb and flow in and out of X-Files-esque keys steeped in mystery. Gravelly spoken word vocals accompanied by female choral sounds. Jacknife Lee – Overview Jacknife Lee AKA Garrett Lee is a huge name in production having worked with the likes of Bloc Party, Snow Patrol and The Killers. ‘Overview’ Is Lee’s first release on Pussyfoot since his 99 album: ‘Muy Rico’. Hollow electronics bleeps, cinematic synths, background drums accompany warped sample vocals musing on earth from space. All-encompassing sound without overpowering the senses. Tojin Kit – Machina Tojin Kit is made up of super producer Jim Abbiss (Adele, Arctic Monkeys), Chris James (Stateless, DJ Shadow) and Massive Attack cohort Kidkanevil (aka Gerard Roberts). The groups sound is vast, electronic and cinematic and their track ‘Machina’ is no exception. 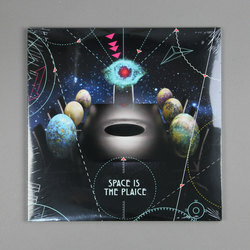 Intergalactic looping keys steeped in beautiful mystery, joined by grinding beats and robotic vocals. There are other notable tracks from Deadly Avenger, Pye Corner Audio, indie legend Luke Haines, DJ Rui Da Silva, Nick Faber and Japanese artists Fantastic Plastic Machine, Chari Chari. TILT and Major Force Productions.